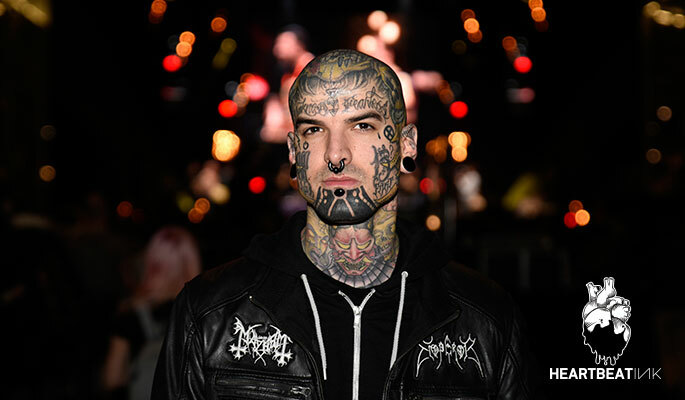 Τhe outstanding parisian Grande halle de la Villette opened again this year its doors to tattoo artists and tattoo lovers on the 4th, 5th and 6 the of March for Le Mondial du Tatouage in Paris, one of the biggest tattoo conventions worldwide. HeartbeatInk Tattoo Magazine was there to record and convey to you this celebration of the tattoo, which this year reached 40,000 visitors. The queue formed from the subway stairs to the venue, from noon, gave us the impression that the art of tattoo attracts more and more people. Once again the Mondial du Tatouage hosted great artists from the global tattoo community which responded to the call of the organizer and well-known tattooist, Tin Tin. The jury was composed by Kari Barba, Luke Atkinson and the "mythical» Filip Leu and Bill Salmon. With over 300 tattoo artists from around the world, there were also some Greek entries with Sake, Kostas Tzikalagias, Dr Pepper, Thomas Gramm, Orge Kalodimas, Alex Gotza, Dimitris Chatzis, Ozone and Siemor. During all three days the tattoo machines didn’t stopped for a moment by the sounds of Djs sets - from Rockabilly, 60's garage to hip-hop - and the concerts of Orange Goblin, Uncle Acid & the Deadbeat, Hangman's Chair and Sticky Boys. Apart from the numerous tattoo artists there were several stands with tattoo supplies, body piercing, merchandise and art exhibitions, seminars and concerts until late in the evening and naturally a specially designed VIP area for artists and media, where we could enjoy a "coupe de champagne”. Photos by Riccardo Manach (Rockin Ricco).